Another April evening in London with the camera of my mobile phone. 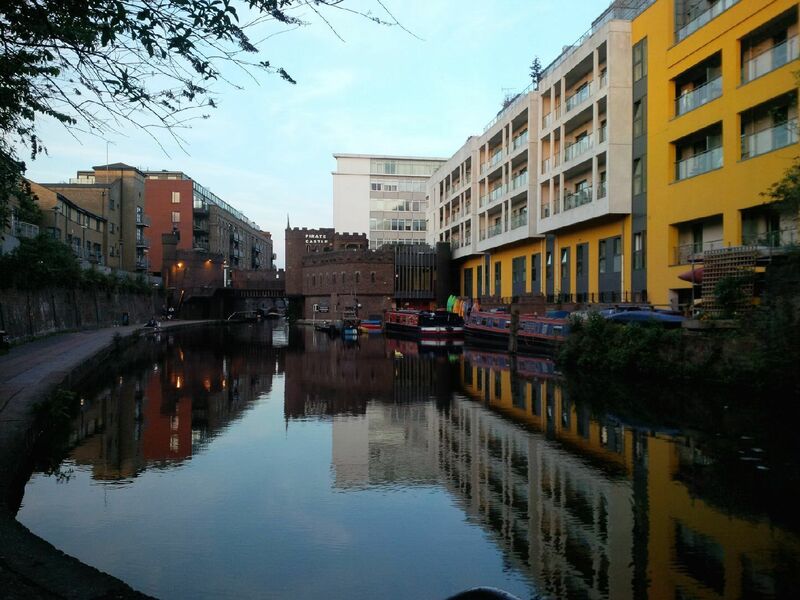 This time along the Regent's Canal, Monday 28 April. 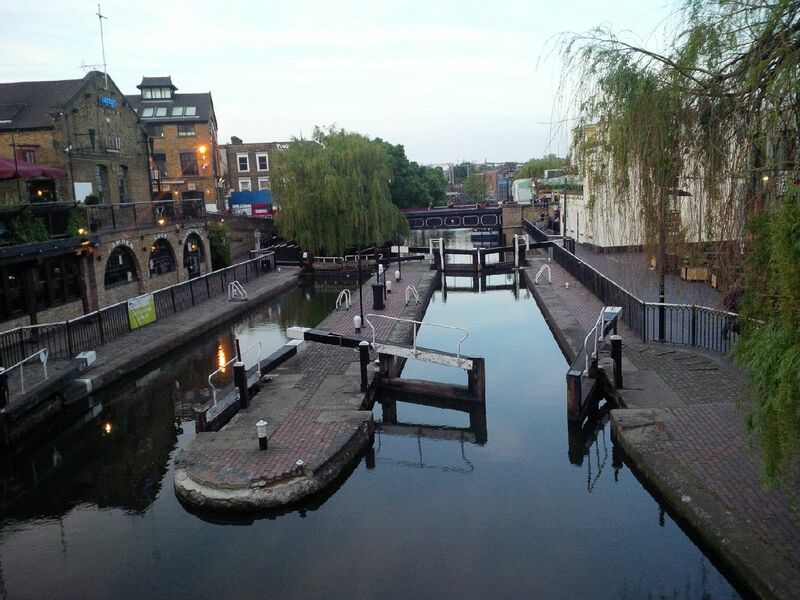 7.55pm on the Regent's Canal approaching Camden Town. 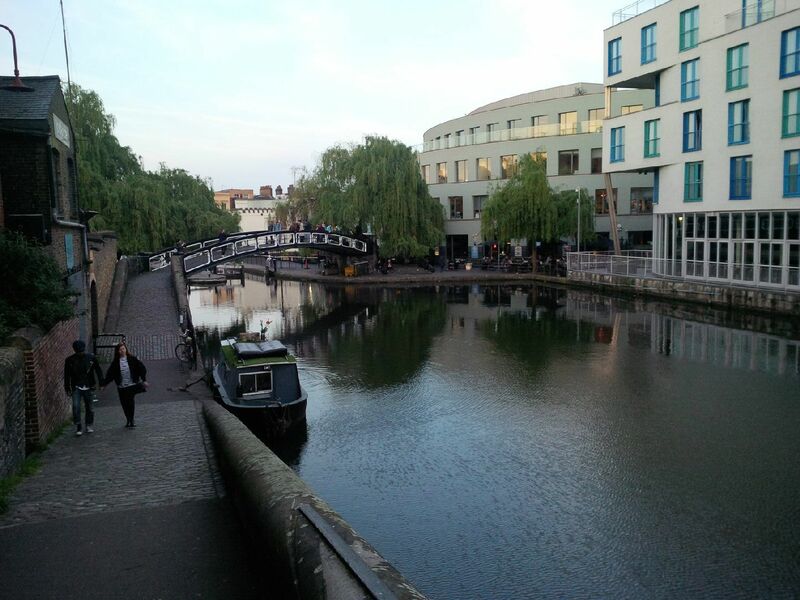 Heading east along the Regent's Canal. 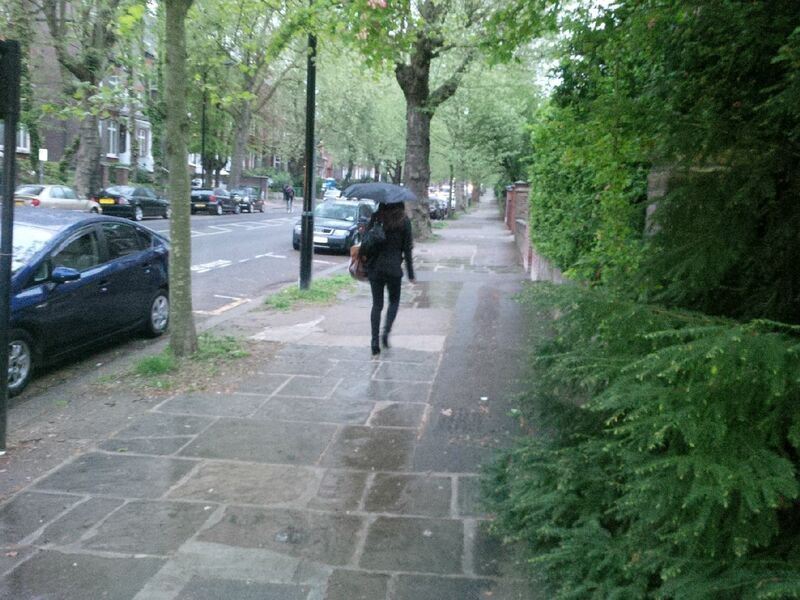 I enjoy the low slanting sunlight of April evenings and the light fall of rain. Sometimes I use my mobile phone to take photographs of moments I like, reflections on the wet streets, the orange glow of brickwork, an umbrella walking by. Houses and tombstones tell stories; I enjoy these too. 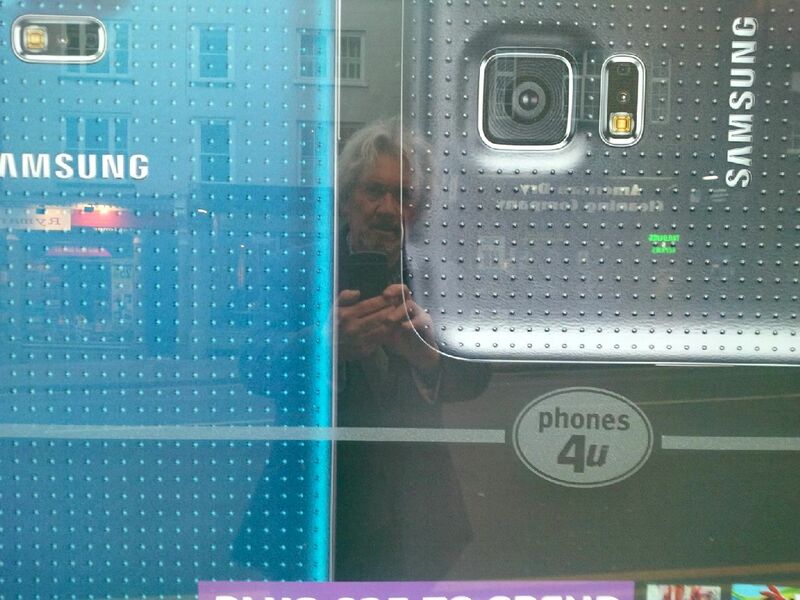 Looking at being looked at. A zebra crossing with its Belisha beacons is one of those subliminally comforting sights, as warming as a childhood cup of cocoa. The orange globes flash on for a second, off for a second, on for a second, and when there are two on opposite sides of the road they flash in alternation so that one beacon is always alight. They are named for Leslie Hore-Belisha, minister of transport in 1934, who introduced them to increase the visibility of zebra crossings. They have been going on and off every second of every day and every night ever since. 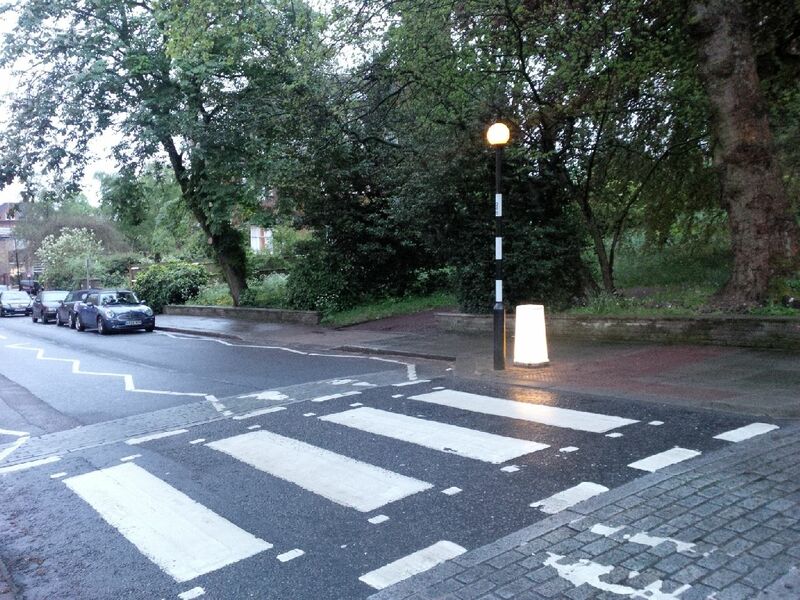 A zebra crossing with a Belisha beacon. 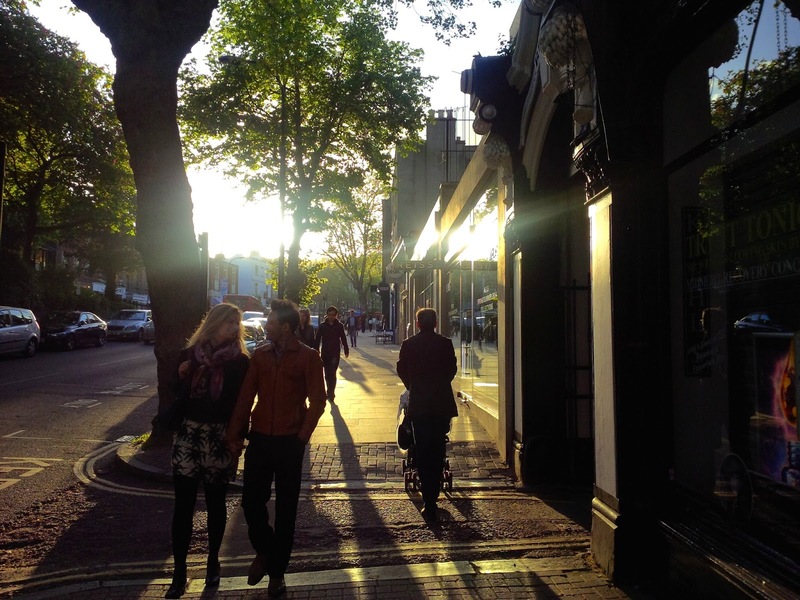 April evenings are illuminated by bright flashes of sunlight. Or they are warmed by an intensity of colour before the sun goes down. 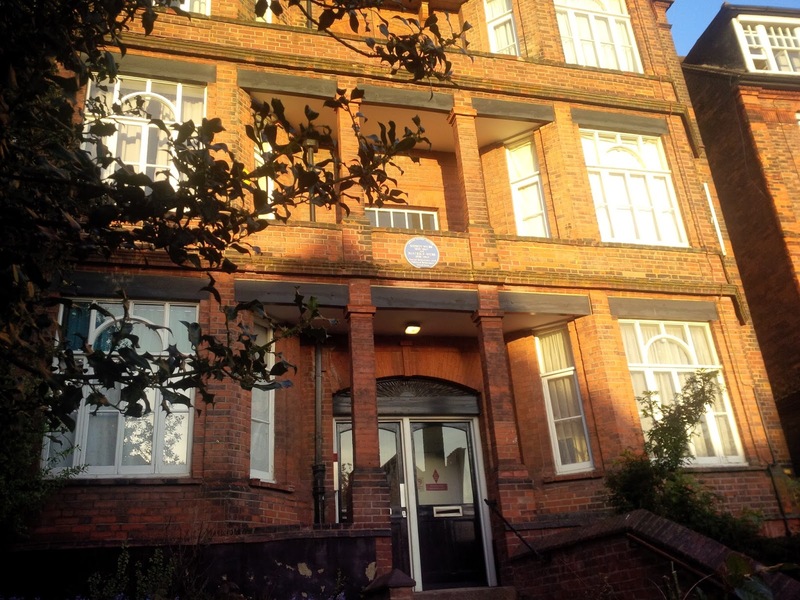 The London home of Sidney and Beatrice Webb. 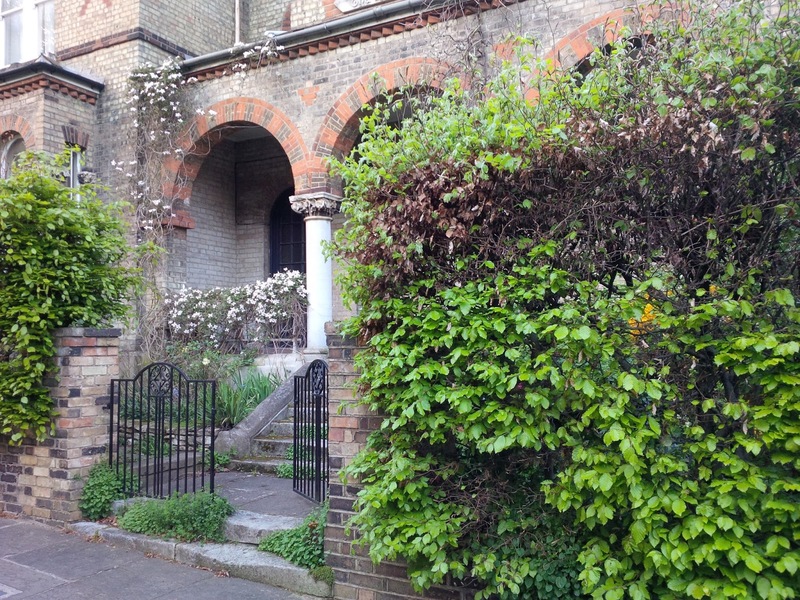 One of the places I pass quite often during my evening walks is the London home of Sidney and Beatrice Webb. 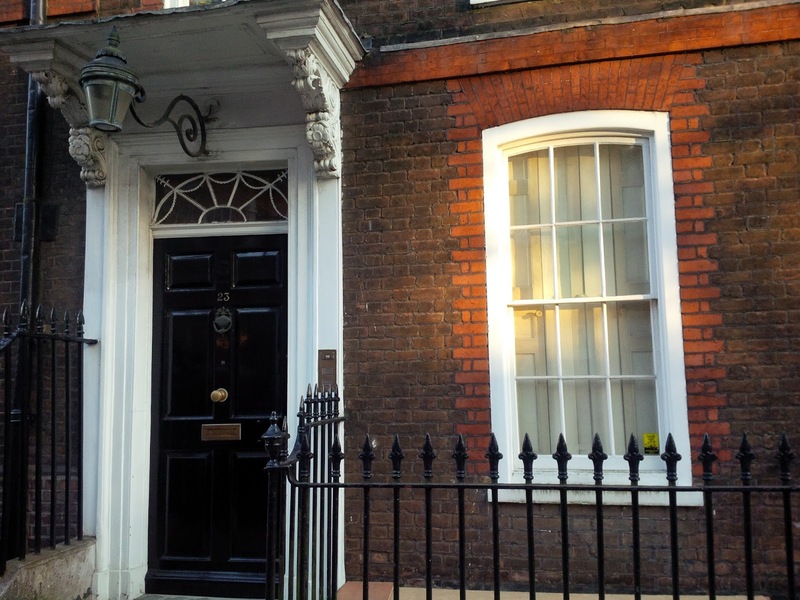 As the Blue Plaque on the facade of their house says, they were social scientists and political reformers. If blue plaques were a bit bigger this one might have said more. 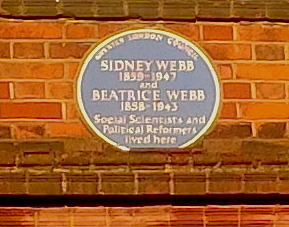 The Blue Plaque at the home of the Webbs. Along with others, including George Bernard Shaw, the Webbs were founders of the London School of Economics and the Fabian Society which worked to bring socialism gradually but inexorably to Britain, which for a while it did. The Webbs were also enthusiastic supporters of the Soviet Union throughout their lives. They visited Russia in the early 1930s and despite all evidence to the contrary they pronounced the forced collectivisation of agriculture which caused widespread famine, misery and millions of deaths to be a wonderful social experiment; they supported the Moscow show trials, used by Stalin to humiliate and liquidate suspected rivals in politics and the military; and they also approved of Stalin's introduction of the gulag system. Their book Soviet Communism: A New Civilization? was described by A J P Taylor as 'the most preposterous book ever written about Russia'. Two of the silliest and most dangerous people of their age, it goes without saying that Sidney and Beatrice Webb became national treasures and are buried in Westminster Abbey. 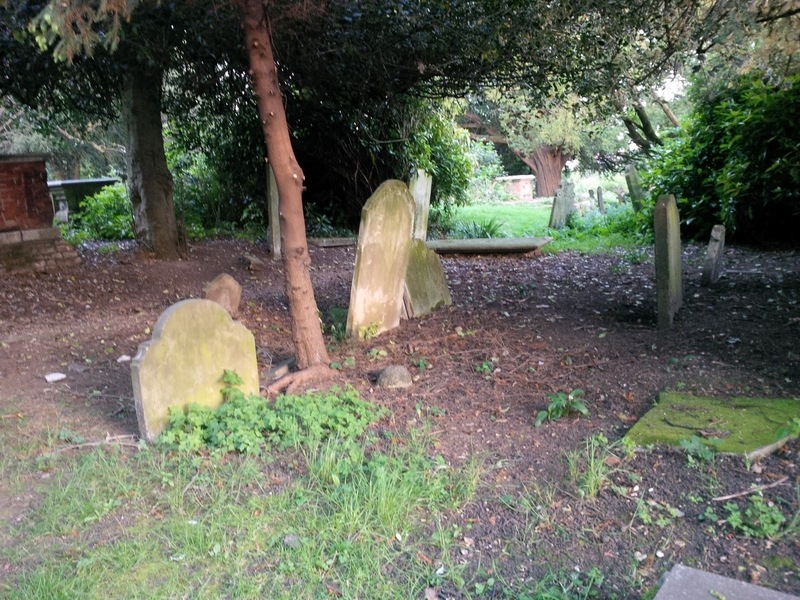 Towards the end of an April evening, as the last of the sun was going, I came upon the tomb of the painter John Constable and his family. He most expressed his genius in his wild and dramatic skies, very English skies, bursting with sunlight, lashed with rain, drifting with clouds like flocks of sheep. 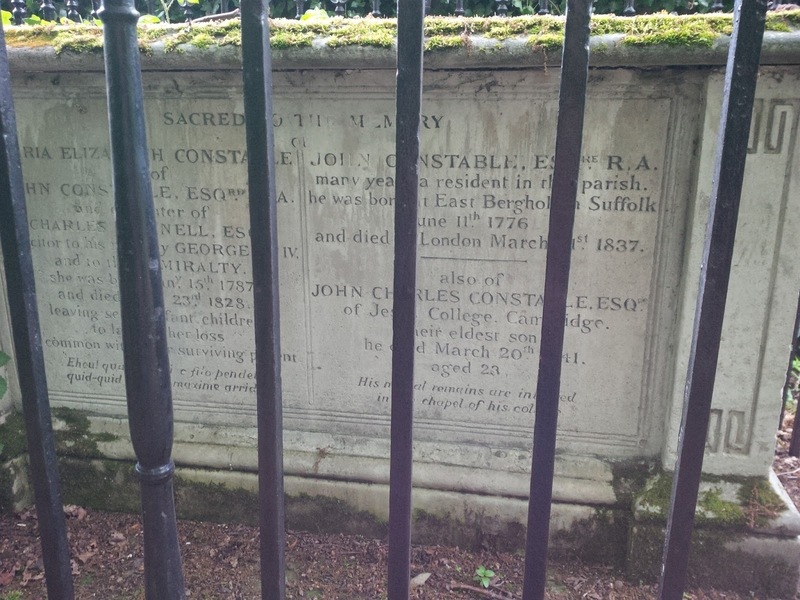 Tomb of the painter John Constable. When I first read the inscription on this tomb I realised that John Harrison was one of the most important men of the eighteenth century. His means of determining longitude at sea opened up the world more than any conqueror or king. 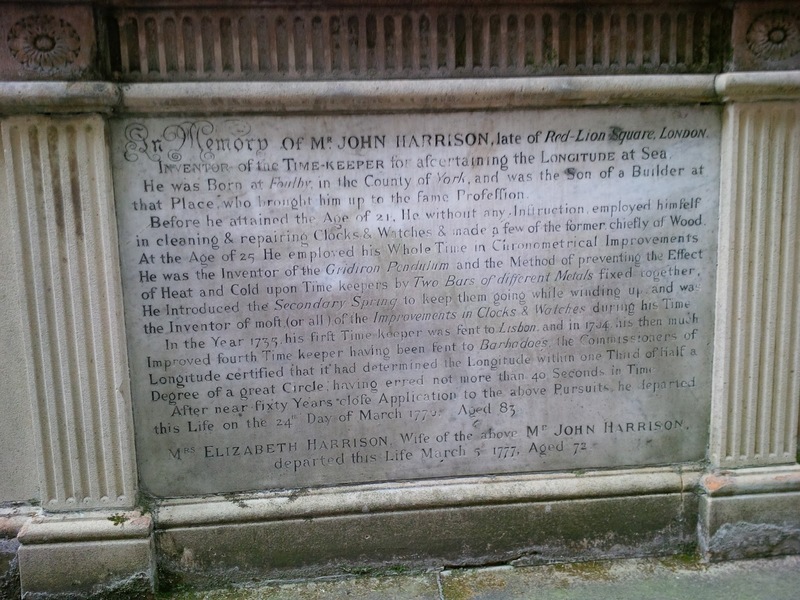 John Harrison's tomb. His clocks opened up the world. 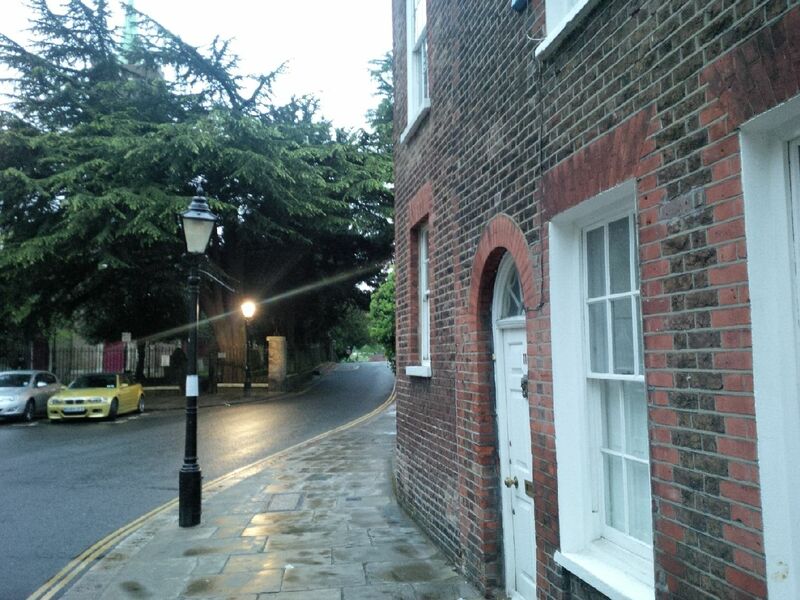 I return to this house again and again; it is one of my favourite houses in London. Called The Hermitage, it was built in 1862 for George Dighton who has been described as 'a painter of much promise and a distinguished rifle shot'. Though the house is perfectly suited to London, its romanesque arches encourage me to imagine inhabiting its loggia and travelling to another time and a faraway place. One of the best things about a light rain are the umbrellas which blossom on the streets of London, like elegant dark flowers. 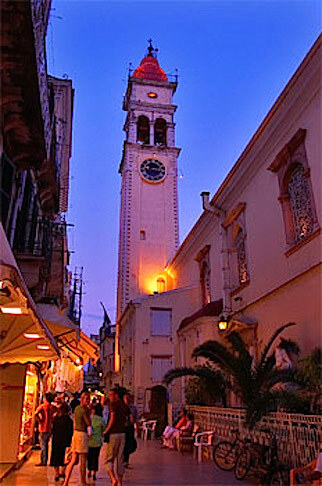 St Spyridon's church, Corfu town. St Spyridon, who lived in the fourth century, is the formidable patron saint of Corfu. Not the least of it is his corpse; though he has been dead for 1600 years you can see him today and even kiss his toes. An icon of St Spyridon. 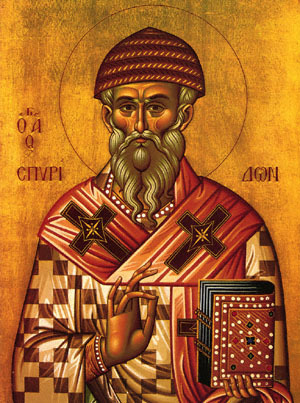 Spyridon was born in Cyprus where he was a determined opponent of the Arian heresy. At the Council of Nicaea in 325 he countered the Arians by giving a dramatically simple demonstration of the Trinity. He took a brick in his hand and squeezed it. At that instant fire shot out from it, water dripped on the ground, and only dust remained. 'There was only one brick', St Spyridon said, 'but it was composed of three elements. In the Holy Trinity there are three Persons, but only one God.' Some say that Spyridon never went to Nicaea at all. But others say that thanks to Spyridon and his brick we have today the Nicene Creed. In 649 the Arabs attacked Cyprus and sometime during the three centuries of devastating Muslim warfare against the island that followed, the remains of Spyridon were spirited away to Constantinople. When that city fell to the Turks in 1453 Spyridon resumed his journeys, this time to Corfu. In Corfu Spyridon did marvellous things. He is credited with preserving the islanders from the plague, and in 1716 he saved Corfu from the Turks who had mustered a vast army and fleet across the straits at Butrint in Albania. But when Spyridon appeared in their midst, brandishing a glistening sword and threatening them with a flaming torch, the Turks panicked and broke and ran. 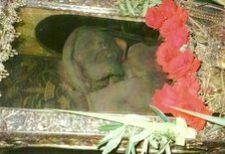 The body of St Spyridon. Spyridon's body is kept as a relic in his church in Corfu town and on the Saturday before Easter Day it is carried through the streets in a religious procession before being returned to his resting place in a cabinet. Not that he gets any rest; to receive the benefit of his miraculous powers, thousands queue to kiss his feet. 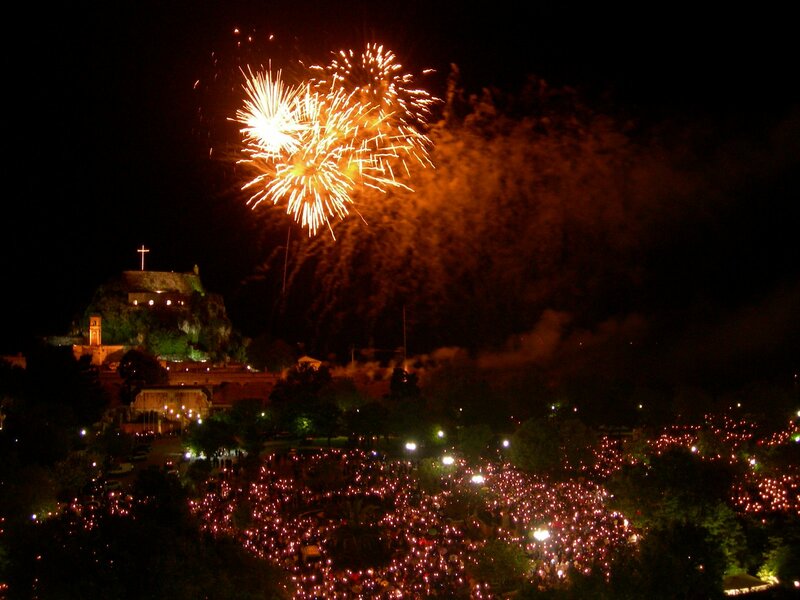 Easter celebrations at midnight in Corfu Town. I was fortunate enough to be here one Easter to join the celebrations. Spyridon buttons, bearing a picture of his corpse, were on sale everywhere, some of them with close-ups of his brown and wrinkly raisin face. The church was packed and I joined the queue to kiss his feet, then we all tumbled outside where on an upper floor of a near by building an unseen band played loud umpah music to the streets below. At midnight the town explodes with flashes and booms. 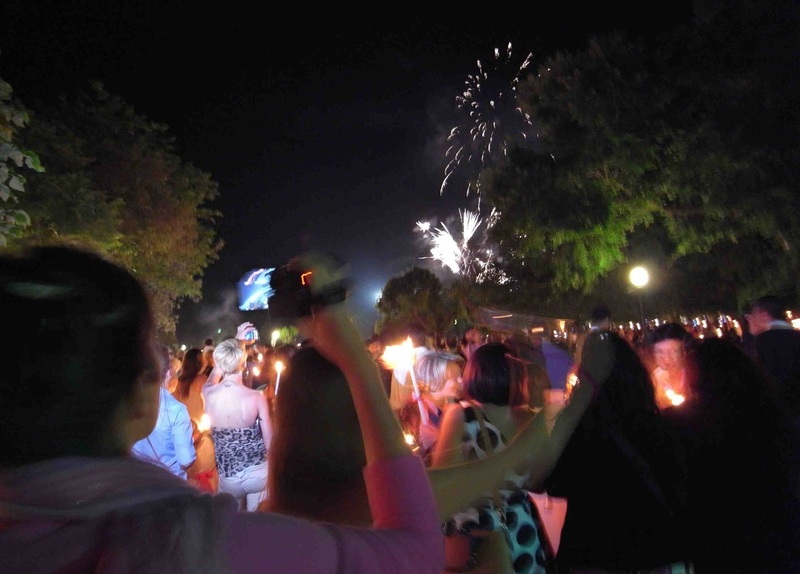 People gather for the Easter fireworks. On another Easter I went to the top of Pantocrator (the Almighty), the mountain that dominates the island and from where you can see even as far as Italy, over 80 miles away. 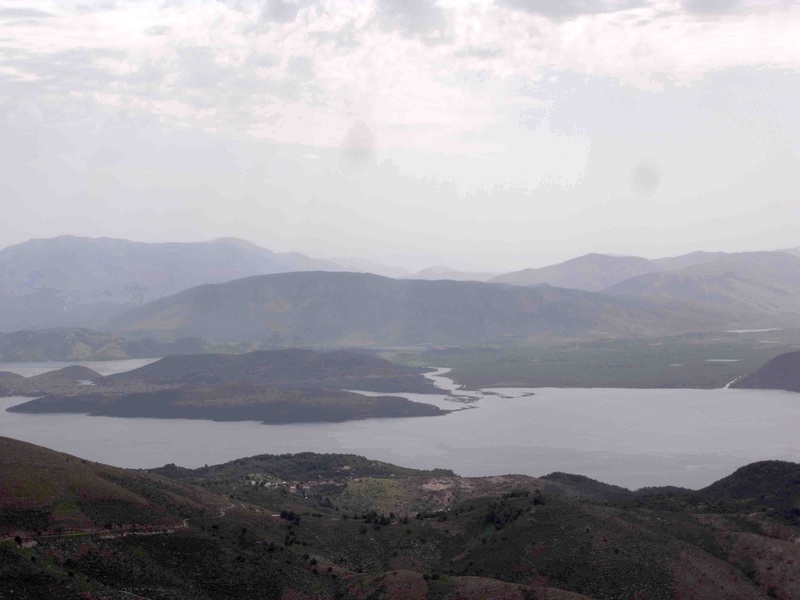 And almost at your feet, in Albania just across the strait, lies Butrint, the scene of Spyridon's triumph. 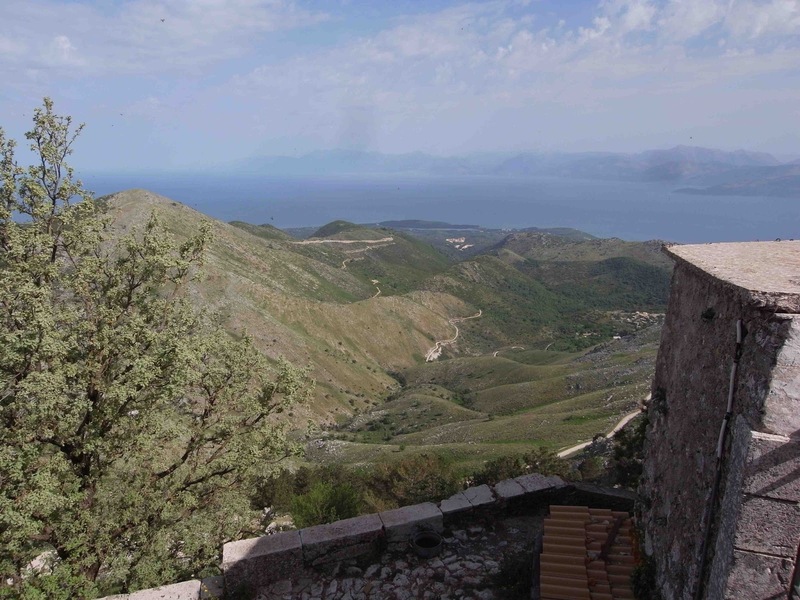 The view from the top of Pantocrator towards Albania. Lawrence Durrell has written about Spyridon in Prospero's Cell, his book about Corfu, and also about climbing Mount Pantocrator. At all events the Saint holds the island in his power; the boats that set out nightly for fishing or daily for foreign ports of call, all travel in his benign shadow; and it is he who welcomes you to port on the days when the deep-trenched north wind blanches the sea, and when the ironclads by the Venetian fort turn slowly on the leash to face it. It is he who guards your spirit when the wind screams down the ravines of Pantocrator. And when you are washed up in the dead calm of dawn, entangled like a sculpture in your broken boat and sprung nets - it is in his image and shadow that your soul finds rest. To him belongs the lovely greeting: Ο Άγιος Σπυρίδων μαζί σου. Rain falls on Butrint on the estuary opposite Corfu where St Spyridon terrified the Turks. 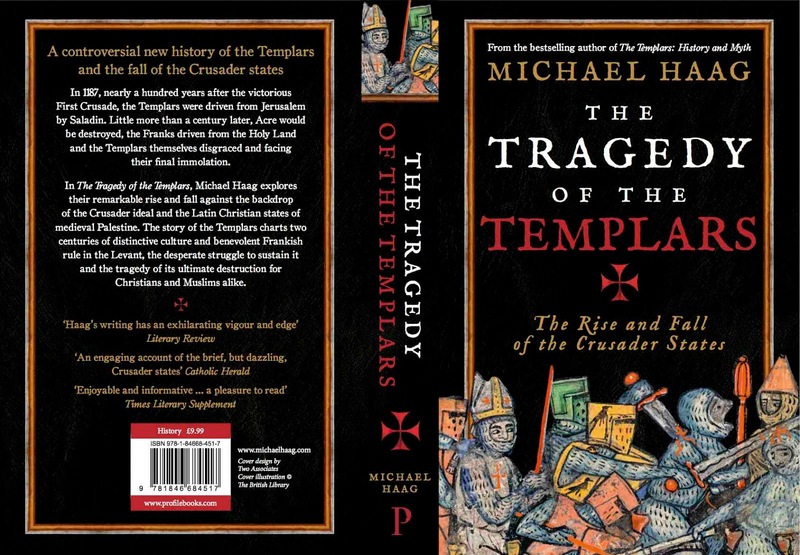 The British paperback edition of The Tragedy of the Templars will be published on 26 June 2014. The following is the Prologue of the book, complete with endnotes. ON FRIDAY 2 OCTOBER 1187, after a twelve-day siege, and less than a century after the victorious climax of the First Crusade, the inhabitants of Jerusalem surrendered their city under the terms allowed them by Saladin. Those who could afford to pay their ransom were free to walk towards the coast; those who could not pay were to be taken away as slaves. A few Knights Hospitaller were permitted to remain to run their hospital for pilgrims located in the heart of the city adjacent to the Church of the Holy Sepulchre. 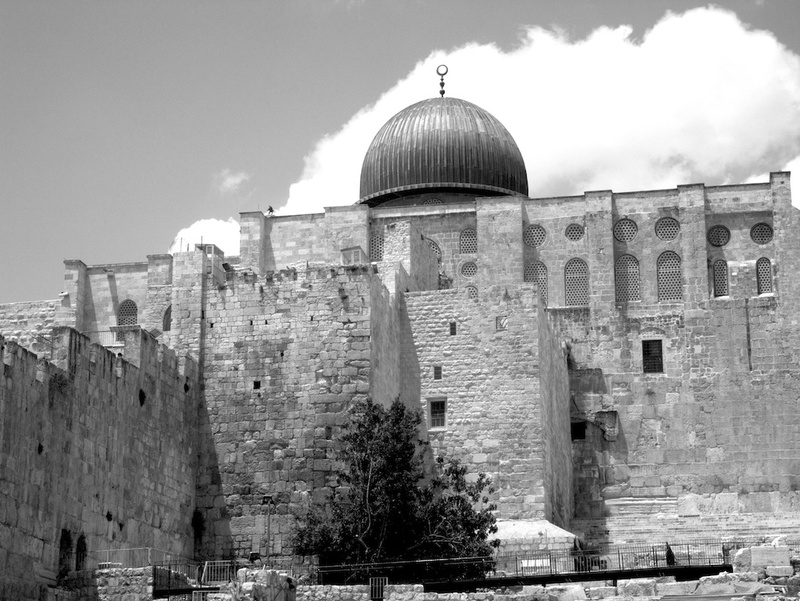 The knights of the Poor Fellow-Soldiers of Christ were driven out altogether – their headquarters had been the Aqsa mosque on the Temple Mount. 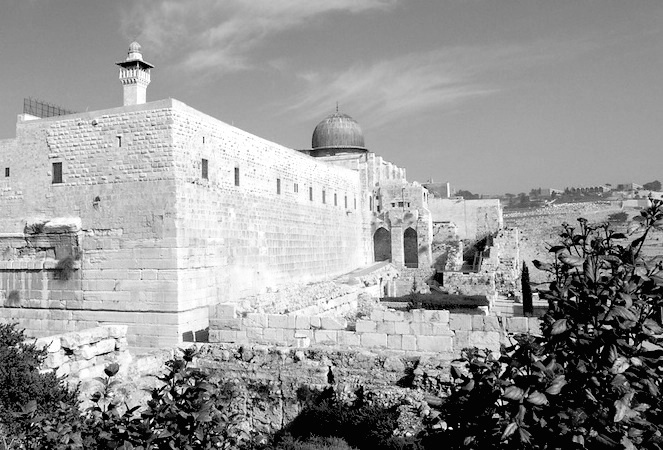 The Franks believed that the Aqsa mosque had been built on the very site of the Templum Solomonis, as they called it in Latin, and it was not long before the knights became known as the Poor Fellow-Soldiers of Christ and of the Temple of Solomon; or, simply and most famously, the Templars. The Templars' Jerusalem headquarters was the Aqsa mosque, which they believed to be the palace of Solomon on the Temple Mount. 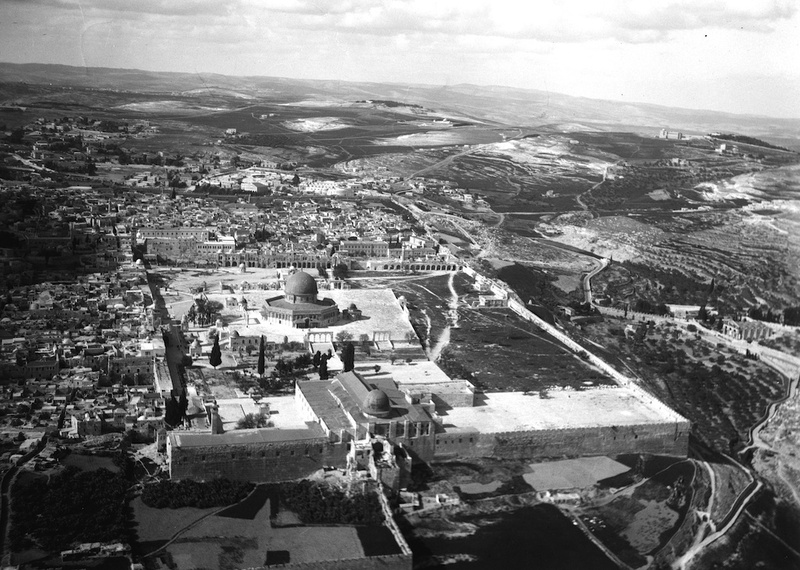 The Temple Mount with the Aqsa mosque in the foreground and the Dome of the Rock at the centre. 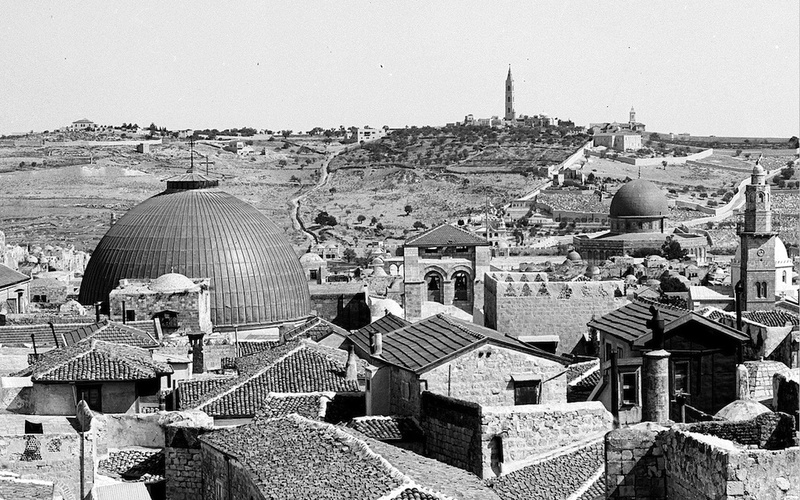 The dome of the Church of the Holy Sepulchre on the right; the church stands on a hill overlooking the Dome of the Rock seen on the right. As well as using the propaganda of jihad to make his Muslim rivals submit to his authority or to eliminate them altogether, Saladin also used jihad as an excuse for imposing Muslim rule on Christians, who even at this time were still the majority of the population in Syria, Palestine and Egypt.15 Jihad has its origins in the Koran, which enjoins Muslims to ‘proclaim a woeful punishment to the unbelievers’16 and to ‘make war upon them: God will chastise them at your hands and humble them’.17 Defined as a ‘divine institution of warfare’, the purpose of jihad is to extend Islam into the dar al-harb – that is, the abode of struggle or disbelief (as opposed to the dar al-Islam, the abode of peace, where Islam and sharia law prevail); and jihad ends only when ‘the unbelievers have accepted either Islam or a protected status within Islam’.18 Jihad is also fought when Islam is in danger, so that when Christians reclaim Christian territory from Muslim occupation, that too can be a reason for jihad. It was a concept that perfectly suited Saladin’s ambitions, providing religious justification for his imperialist war against Outremer. The southwest corner of the Temple Mount, headquarters of the Templars. Saladin and his army conquered Jerusalem and made war in the Middle East as an alien power – alien in religion from the Christian majority and both ethnically and culturally alien from the indigenous Greek-, Armenian-, Syriac- (that is, Aramaic-) and Arabic-speaking population. Saladin himself was a Turkified Kurd who began his career serving the Seljuk Turks, who were invaders from Central Asia, and his army at Jerusalem was Turkish, though with a Kurdish element.19 The Turks looked down on the Arabs whose rule in the Middle East they had replaced, and the Arabs viewed the Turks with bitter contempt; nor is there much evidence ‘of the Arab knights learning Turkish, the language of their military overlords, nor that the Turks learned much Arabic’.20 Being alien also meant being indifferent, so that after his capture of the city Saladin acknowledged that the Franks had ‘turned Jerusalem into a garden of paradise’;21 yet he himself neglected Jerusalem and caused it to decline,22 just as he destroyed everything he could along the coast, regardless of the welfare of the native population. This was no war of liberation, of reclaiming lost lands; it was the continuance of previous aggression, of Islamic imperialism driven by Saladin’s dynastic ambitions. 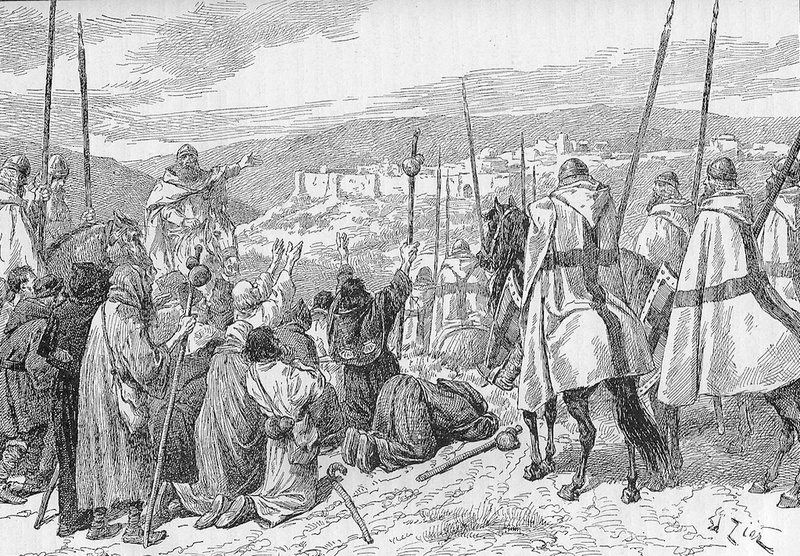 Detachments of Templars protected pilgrims as they made their way along the wilderness road from Jerusalem to the site of Jesus' baptism in the river Jordan. 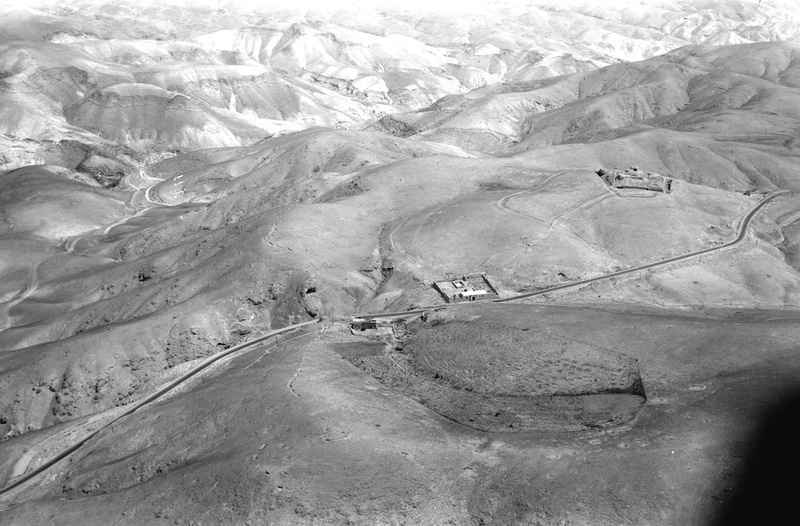 A crusader castle stands on the right. The Templars bring a party of pilgrims safely to Jerusalam. But in those autumn days of 1187 after Jerusalem had fallen, neither the faith nor the fighting spirit of the Franks was entirely overwhelmed. The kingdom of Jerusalem had suffered a comprehensive defeat from which no feudal monarchy could have emerged with its powers unimpaired, but the military orders survived and became more important than before. This was particularly true of the Templars, whose single-minded policy and purpose was to preserve, to defend and now to regain Jerusalem and Outremer from the full might of the Turks. Paperback cover for The Tragedy of the Templars. 1 Imad al-Din, in Gabrieli, Arab Historians of the Crusades, p. 163. 2 Imad al-Din, as quoted by Abu Shama in the Recueil des Historiens des Croisades, Historiens Orientaux, vol. IV (Paris, 1898), p. 333, and translated and reproduced in Hillenbrand, Crusades, p. 301. 3 Imad al-Din, in Gabrieli, Arab Historians of the Crusades, p. 147. 4 The Church of the Holy Sepulchre was closed to pilgrims for five years, only opening in 1192 and then at a charge of 10 bezants. 5 Anonymous, De Expugnatione Terrae Sanctae per Saladinum; repr., trans. Brundage, The Crusades: A Documentary History, p. 163. The author of De Expugnatione, though anonymous, is thought to have been an Englishman in the service of Raymond of Tripoli. 6 Imad al-Din, in Gabrieli, Arab Historians of the Crusades, p. 156. 7 Ibn Shaddad, in Hillenbrand, Crusades, 189. 8 Imad al-Din, in Gabrieli, Arab Historians of the Crusades, p. 160. 9 Tyerman, God’s War, p. 353. 10 Hillenbrand, Crusades, p. 180. 11 Lyons and Jackson, Saladin, p. 240. 12 Ehrenkreutz, Saladin, p. 237. 13 Lyons and Jackson, Saladin, p. 280. 15 See for example Tyerman, God’s War, p. 52: ‘The question of the extent of Arabisation and Islamicisation of conquered lands remains obscure and vexed, but it appears that the process was slow, uneven and, by the eleventh century, still incomplete. It is not certain whether there was even a Muslim majority in Syria or Palestine when the crusaders arrived in 1097.’ The evidence for a Christian majority is far greater than Tyerman admits and will be dealt with later in this book. 16 Ibid., sura 9, verse 4. 17 The Koran, trans. Dawood, sura 9, verse 14. 18 See Cyril Glassé, The Concise Encyclopaedia of Islam, Stacey International, London 1991. 19 Hillenbrand, Crusades, p. 444. 21 Lyons and Jackson, Saladin, p. 276. 23 William of Tyre, A History of Deeds Done Beyond the Sea, pp. 406–8.